It's been nearly two years since the disappearance of James Martin Roberts but his parents and local law enforcement continue the search. Roberts was last seen on Thursday April 21, 2016 at approximately 12:30 pm near the intersection of Hardin Street and Rivers Street around the ASU Convocation Center. Extensive searches in Boone and in the county produced no answers. The search for Martin had led law enforcement to check tips as far as the Outer Banks and up into Virginia. The Boone Police Department has also worked with various agencies along the Appalachian Trail and as far away as Ohio. Now Martin's disappearance will be featured on a national TV program. Boone Police Chief Dana Crawford confirms to WataugaOnline.com that Investigation Discovery/ Discovery/NBC is working on an episode about James Martin Roberts. “We are trying to keep this story in the public view in hopes that someone will remember something and maybe that will generate a lead to help us find out what happened to Martin. Our detectives are still in contact with this family on a regular basis and Boone Police Department is in full support of this family.” Crawford added. A Facebook page related to finding Martin recently provided an update also announcing the project. “We have been working behind the scenes since before the holidays on a project with several different producers from Peacock Productions / NBC News. They requested we keep this project quiet until after filming was completed. They wrapped today and will be heading back to NYC tomorrow!” wrote John Roberts, Martin's father, on January 24, 2018. The post goes on to say that the ID – Investigation Discovery Channel will be covering Martin’s story on an upcoming episode of their show “Disappeared”. The one hour program will be broadcast around the world via cable, satellite, internet streaming, the ID Go app, etc. A broadcast date is not yet known. “As we are very sad this is still needed, we are excited about getting Martin’s story out to an even larger audience.” notes Roberts. 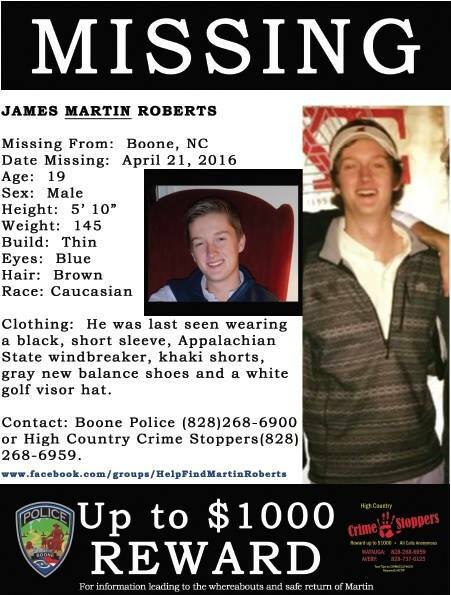 Anyone with information about James Martin Roberts is ask to contact Boone Police Department or High County Crime Stoppers.